I generally prefer Telerik controls, but I’ve got a client that uses Developer Express. 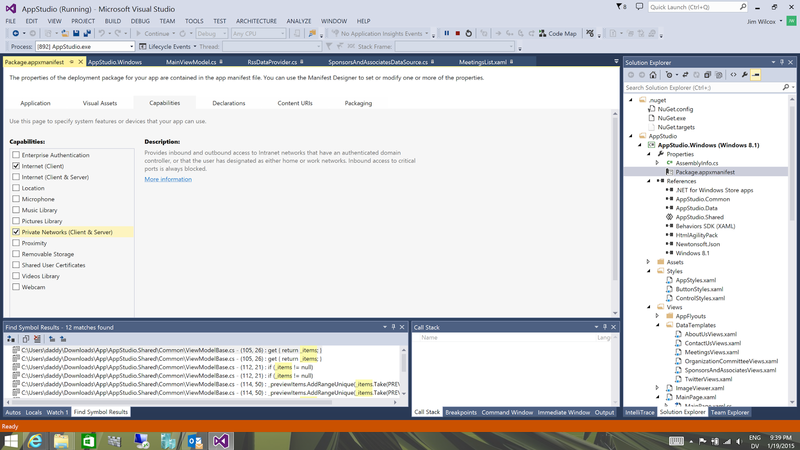 I recently had a need to synchronize columns in a Developer Express WPF Master/Detail grid. It’s a bit of an unusual circumstance, where we have Master / Detail records that use the same view interface, but found the TreeListControl unable to scale up to the demands of our use cases. The client still wanted the detail grid’s columns to appear to functionally be the same column as the master record’s (with the ability to show/hide the detail). Thankfully, the Dev Express GridColumn class is a DependencyObject, and all the needed properties are exposed as DependencyProperty’s. Finally, since this was an MVVM project, I didn’t want the functionality in code-behind, so I abstracted the code for this into a Behavior. Here’s the snippet representing the detail grid definition…. I expect this to cover 90% of our needs, the other 10% has to do with row selection across master/detail boundaries, but that’s a story for another day. In the meantime, let me know how this makes ya feel… leave a comment, below. Thanks to everyone who joined me for my Boston Code Camp 23 presentation. Shuffling data around is a core responsibility of any serious computing platform. Windows Universal really goes above and beyond the mundane call of duty with consistency and utility. It’s part of what makes the Windows client platform a true “cloud car”, especially with its Backup, Roaming Settings / Folders, and Roaming Password Vault capabilities as native functionality… all from the Windows.Storage namespace. For the individual who asked what encryption level the Windows Password Vault functionality uses, I looked it up, and it’s 128bit AES encryption. Stern stuff there. One detail I missed however… the LocalCache storage area. LocalCache is like Local except that it is not backed up. LocalCache differs from Temporary storage in that the OS will not wipe it as it occasionally does the Temporary storage. Next time I do this presentation, I’ll make sure to update it to discuss LocalCache. Here’s a comparison of the storage options available to developers in the 8.1/universal platform. Note that each user on a device gets their own app-specific sandbox *and* OneDrive space for each installed app. They were inspired, though, and that’s the important part. So it breaks my heart when I see a Windows Phone that’s gone awry. Among the many I’ve come in contact with, I’ve seen one or two develop issues that seem outside of normal hardware wear & tear. My own device has occasionally had trouble with its SD card, occasionally forcing a restore. These are annoyances to me, Windows Phone is a cloud car, so resetting the device and getting it back to normal is really only a mater of re-entering credentials, and the phone’s back in business. The restore tends to re-apply start-screen layout and the set of installed apps on the device… the apps themselves are responsible for their individual recoveries, typically from their own cloud backups. The few times I’ve been forced to do a full hard reset & restore, it’s been an ordeal that typically lasted under an hour (with a good Wifi connection). Power button: the typical short-click which should toggle the device in & out of standby mode simply was not operating. Long clicks, intended to shut the device down completely, were working, so… not a hardware disconnect. In order to wake the phone up, I had to plug in a power source… and then had to wait for it to put itself to sleep. App updates: app updates were identified and the device would queue them, but rather than automatically downloading and installing, they’d hang in the download queue, all marked as Pending. Occasionally one would come up with an error, but a retry would simply hang it back in Pending state. Power saver: on a whim, I put the device in power saver mode. At first, it wouldn’t take the change. Then I told it to always go in powersaver mode, and then, ironically, I couldn’t get it OUT of power saver mode. The end solution: hard reset, but don’t restore from a backup… just manually set up your accounts and re-download apps. It took me a couple hours, but to get my 1520 back on track again, it was well worth the time. In retrospect, I’m also happier because I didn’t re-install a ton of apps that I don’t use anymore, so the device is much leaner. The Windows Phone platform is relatively mature… it doesn’t fail often, but I think I’m going to have to pick up a better SD card. The hard part is that I think I’ve heard rumors of some of these symptoms on devices that don’t have SD card slots. My understanding is that it has something to do with the Cyan firmware update. The Denim firmware may provide more stability, and that update started rolling out to devices in December with a promise that by the end of that month, it would be rolled out to the full Lumia nation. We’re pushing into Feb 2015, and most in the US are still waiting. [Addendum, 5/7/2015]: My Lumia 1520 had a relapse of the above symptoms on Windows Phone 8.1.1 / Denim. On a whim, I decided to try upgrading to the Windows 10 Insider Preview. The problems with the SD card intensified as well. I finally bit the bullet and replaced the SD card. I did have to hard reset the phone back to the “stock” Windows 10 Insider Preview, but after that, not only were all the above symptoms resolved, but another long running annoyance… a problem I thought to be related to the Lumia 1520 itself, went away. The problem… often, entering the unlock code, number presses would repeat so quickly that the phone would fail to unlock. Occasionally it was bad enough to lock my phone for a minute or two. Again, this issue is now resolved along with the other symptoms I noted in this post by replacing the SD card with a new one. Recently, I upgraded the Granite State (NH) SharePoint Users Group’s website from WSS 3 (MOSS 2007 generation) to SharePoint Foundation 2013. The upgrade itself went as well as a 2007 to 2010 to 2013 upgrade could go, in general. The only real “problem” I ran into was the Windows Phone app I wrote for the group years ago. It was coming up with a 401 error trying to grab content from lists.asmx. The app loads content from the #NHSPUG web site (http://granitestatesharepoint.org), mostly via RSS feeds. I put a little extra effort into this. Using AppStudio (http://appstudio.windows.com), I found a couple hours… after that, I had not only a much prettier v3 of the Windows Phone app, but a Windows 8.1 (tablet style) publishing package as well. The Windows 8.1 edition of the app wouldn’t load the content from the users group website. With some debugging, I found that attempts to load the content were coming up with “Unable to connect to the remote server. hresult= -2146233088”. Turns out the error had to do with the fact that I had not enabled Capability “Private Networks (Client & Server” in the Package.appxmanifest. Ironically, the app works fine anywhere except where I was trying to test it: on the same network as the content source server. So, to be fair, this is an environmental/configuration issue, not AppStudio, but it was worth mentioning, since my original assumption led me down that path. Maybe this will help someone else. Happy New Year! I hope you enjoyed the holidays! I took time off for the holidays… not as much as I’d have liked to, but enough to enjoy it. The cobbler finally got a chance to tend to his own shoes, at least infrastructure wise. A few years ago, I caught that MS was giving away a license to Windows System Center Core, and I realized I had enough retired hardware to cobble together a hobby-level host. I then did a Physical->Virtual on my small network of Windows 2003 based servers that I ran the NHSPUG website from. The setup was nice, actually… all three virtual machines ran with room to spare on what was originally an old client-class PC. With dynamic RAM turned on and all three VMs cranking, they occasionally managed to consume nearly a third of the host’s 8GB of RAM. Having recently had opportunity to get a hold of platform MSDN licensing, I upgraded my entire home network infrastructure by two platform generations across the board. Seriously… Windows Server 2003 -> 2012 R2 64, SQL 2005 -> 2014, SharePoint WSS3 -> SharePoint Foundation 2013. Almost all of it was build, replace, rip… build new VMs, integrate them into the domain, migrate data & config as needed, then shut down the systems they replace. The fun one was SharePoint WSS 3.0 upgrading to Foundation 2013. I had to bounce the content databases off a spare 2010 farm I had left over from a project at work. It was nice that it was possible to do that, given that the 2010 farm was a different domain. It’s amazing how much you can get done in short order when you are a one-man IT shop… the communications overhead savings alone is unreal. The hard part is that newer software in the 64bit range uses much more system resources, so I have extended hosting not just to my System Center, but also to two Windows 8.1 Pro systems running Hyper-V, just to spread out the necessary load and provide some critical system redundancy. With that, only obvious thing externally is that the Granite State NH SharePoint Users Group website ( http://www.granitestatesharepoint.org ) is now SharePoint 2013 based. Internally, things generally seem a touch faster, smoother… maybe that’s just psychological, but I notice the difference, even if my wife & kids think it just functions as always, as expected. I guess the irony in this is that my hobby infrastructure backlog is knocked down a few more notches than I thought I would ever get to… (yes, I took time off from work, and, to chill, I did some of what I do at work.) now my hobby development backlog has new possibilities and subsequently grown substantially. One of the first things I’ve got to take care of is the few services the SharePoint upgrade has caused… the NHSPUG site still has some cosmetic issues I want to sort out. My Windows Phone apps that integrated with the WSS3 site are now broken, and I have some jiggering to do with my dev environment before I can even diagnose them. That doesn’t even cover some of the things I want to do with the NHWPAD group and my hobby/portfolio projects (e.g. Jimmy Sudoku).